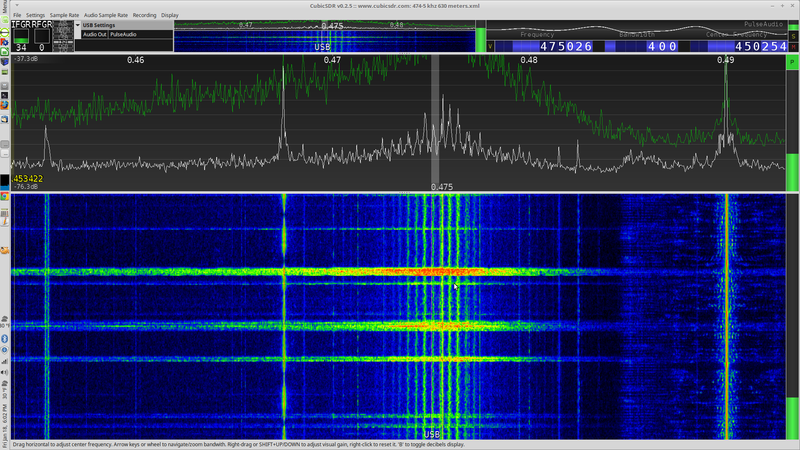 I have Linux, as such is barley supported with cubic sdr, a very limited app. Does anyone know where the config file is for cubicsdr? My scope (BK-1472c) hasn't been used much and the contacts for the 10v/div setting were oxidized, thus showing 60 v p-p. Rotating the selection dial a few times indicated the error. I grew up a block form a 50kw am station, WJJD. My antenna in my yard would light a florescent bulb if wrapped around it, without a tuned circuit.. I had a diode rectifier to my hi-fi speaker, though they went off and Salt lake city sunset, testing at night would wake me up and Id have to get up and disconnect it. The gutters on the house would play country-western, before country was country. As kids we would climb on the guy wires and sometimes get stung, didn't know why, couldn't see any sharp wires sticking out. Well it seems OK on VHF I receive 2 or 3 weather stations with just a small wire, still deaf on MW/LW. I found this code in Soapysdrplay, settings.cpp. I think IF mode refers to frequency, 0, 450khz, I dont see anything setting about low IF mode. I hope this helps and best wishes for finding good news! I found the problem. My expensive Teflon jacketed coax from the transformer to ant port had a short in it. I fixed it by the method.. I connected the power supply across it, spark, no more whiskers. Its working now. ...A screen shot of the 630 meter band. Im using a 480 khz ceramic resonator across the antenna leads in addition to the paralleled tuned circuit, it can be tuned about 10 khz. There's a comb right on the band, I think its from an LED light in one of the neighbors poll barn, my antenna runs 200 feet from it and it seemed be be stronger when I extended it. The upper green trace is peak, lightning from the approaching snow storm. You can see the filter response. Im going to make a vxo from the resonator. arcosine wrote: I found the problem. My expensive Teflon jacketed coax from the transformer to ant port had a short in it. I fixed it by the method.. I connected the power supply across it, spark, no more whiskers. Its working now.